Transmitter binds to Inductrix and arming switch (switch A) seems to respond, but no stick inputs affect behavior. Even in Betaflight, the motors do not correspond to the motor control panel in the Motors section. Wondering if this is a bad configuration of the FC (did not tamper with BF settings!) or something else. 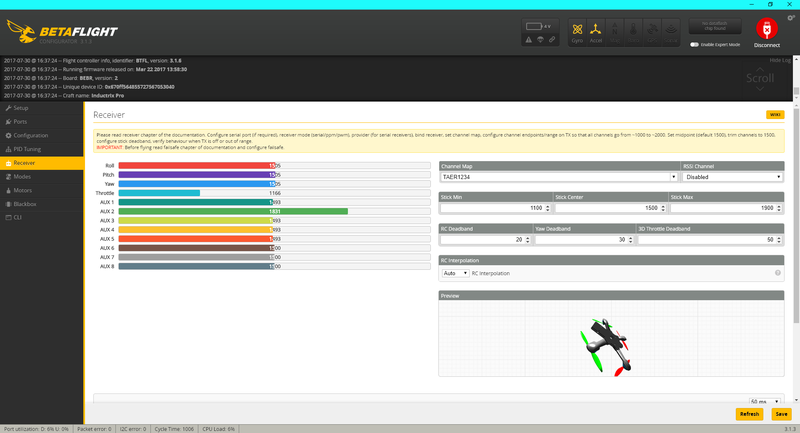 Do the stick commands register properly in the Betaflight receiver tab? All register from 1165 to 1840 with center at 1505. Sad that they didn't do this for you... Your endpoints are out of whack, you need to adjust your transmitter so they read from 1000-2000 and center at 1500. Once you do that it should arm properly. I have them all adjusted, but even in the motor section, I adjust the Master and no motors fire up. So the FC is not communicating the the ESC's. Check to see if the wrong protocol is selected. I don't know how these brushed systems are integrated, but that would be my bet. Let it sit overnight, plugged it into Betaflight about an hour ago and wouldn't connect to the same COMM port. Red and white light lights are flashing continuously at rapid intervals with unsuccessful binding.